Long time readers may recall a post here in July entitled “Are Cell Phone International Calling Rates Legal?” While the cellular establishment probably viewed this as just more criticism, one of the big 4 was planning a bold move. Starting October 31, Simple Choice individual and business customers will automatically get unlimited data and texting in more than 100 Simple Global countries worldwide, and will only pay a global flat rate of .20 cents per minute for voice calls when roaming in the same countries. No activation or extra monthly fee necessary. John Legere, T-Mobile's outspoken CEO, describes international roaming fees as "completely crazy,” and last night he resolved to do something about it. Often, travelers have to pay an extra $100 to their provider to get any cell service abroad. Or they must sign up for a short-term plan with a carrier in the country they are visiting. Your blogger avoids this problem by having an unblocked basic GSM phone he bought in Asia for $25 that he buys a new SIM card for while visiting each country overseas. It is a pain, but a lot less than charges from US carriers prior to T-Mo’s announcement. Since competitive international charges from US to most industrialized countries are under $.20/minute now, why did the cellular carriers ever charge such high rates? Hopefully this change means that competition in the cellular industry is becoming more effective. While T-Mo is fine tuning its rates for cell calls from US to overseas, those rates are, in the opinion of your blogger, illegal. The T-Mo rates are $1.99/minute to most of Western Europe, rising to $2.69 and higher for developing countries. 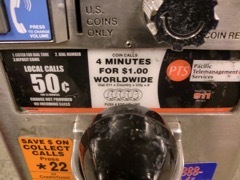 This in a world where the fair market price for international calls is under $0.20/minute. If you want to pay that type of rate, T-Mo, like all other major carriers, insists you pay $7 or $10/month. This type of pricing is used by all the major cellular carriers at present. If Bloomberg is right about the 90% profit margin, you can see why! I would love to print an explanation from a carrier of why this is consistent with 47 USC 201(b). I don’t think it is. I urge consumers who incur such charges to file an “informal compliant” with FCC and protest the charge as I did once successfully with a Verizon international landline call. So kudos to T-Mo for this bold change and let’s hope more competition comes now! If you want to know why I think the major carriers’ international rates of > $2/minute is illegal and beyond any marketplace rates, check out this photo take in October 2013 of a pay phone in New York City. If this company can charge $1 for a 4 minute call for walk customers it has no relationship with and further has to service the equipment and rent its space, you would think that T-Mo, AT&T, etc. could connect you with an overseas location for comparable prices. The first shot in the attack on cheap data plans was fired last week by T-Mobile. The company said the legacy plans -- many of them featuring unlimited, uncapped data downloading -- will be terminated and subscribers will be moved to comparable but more expensive current plans, the carrier said, because it was "reducing the number of older plans in our systems."